George Gaylord Simpson (June 16, 1902 – October 6, 1984) was one the most influential paleontologist of the twentieth century and a major figure in the modern evolutionary synthesis, helping to integrate paleontology into this newly emerging synthetic theory. His works, Tempo and Mode in Evolution (1944) and Principles of Classification and a Classification of Mammals (1945), were particularly instrumental in this respect. An expert on extinct mammals and their intercontinental migrations, Simpson is also noted for dispelling the view that the evolution of the horse was a linear process culminating in the modern Equus caballus and for anticipating such concepts as punctuated equilibrium. One of Simpson's famous quotes is, "man is the result of a purposeless and natural process that did not have him in mind." This is one of the dogmas in evolutionary science. It involves an almost religious-like belief, since in reality, while there is a lot of evidence for the theory of descent with modification (the pattern of evolution), the theory of evolution by natural selection (the process or mechanism) on the macroevolutionary level remain an unproven extrapolation from processes on the microevolutionary levels. Reconstruction, left forefoot skeleton (third digit emphasized yellow) and longitudinal section of molars of selected prehistoric horses. 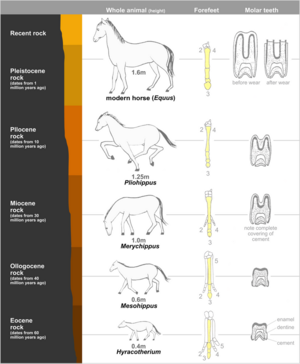 Simpson's detailed analysis in Horse (1951) countered the popular idea of a single-line of evolution of the horse from a fox-sized hoofless ancestor (Miller 1990). George Gaylord Simpson was in Chicago on June 16, 1902, the first son and third and last child of Joseph A. Simpson, a lawyer, and Helen J. (Kinney) Simpson (Laporte). His father handled railroad claims as an attorney, but became involved in land speculation and mining, which led to there moving briefly to Wyoming, and then in 1903, to Denver (Laporte 2007b). Simpson had a strict, fundamental Presbyterian upbring, but was to reject formal religion by the early teens (Laporte). In 1910, he talked his parents into the purchase of the eleventh edition of the Encyclopedia Britannica, which he contributed to the purchase of, and he read it straight through (Laporte 2007b, 2007c). He graduated from elementary school in 1914, at the age of 11, having completed 8 grades in 6 years, and graduated high school in 1918, close to his sixteenth birthday. In 1918, at the age of 16, Simpson entered the University of Colorado at Boulder, but his father lost his mine in Alma, Colorado, and with the family finances at a low point, he briefly dropped out (Laporte 2007b). After returning to the University of Colorado, he stayed until his senior year, 1922, when he transfered to Yale because he was advised it was the best place to study geology and paleontology. In 1923, he secretly married Lydia Pedroja, despite it being contrary to Yale's regulations. In June, 1926, he completed his Ph.D. in geology in Yale. In 1927, Simpson took a position as assistant curator in vertebrate paleontology at the American Museum of Natural History and in 1928, was promoted to associate curator. By 1932, Simpson was formally separated form Lydia and had custody of one daughter, Helen, while one daughter lived with the maternal grandmother, and his two other daughters with Lydia were under her custody (Laporte 2007c). However, in late 1932, Lydia was committed to a mental hospital and Simpson's parents cared for these two daughters. Lydia had had a history of mental problems even before meeting Simpson (Laporte 2007b). In 1932, Simpson began to live with Anne Roe, a childhood friend, who also had obtained a Ph.D., from Columbia University in psychology, and had divorced her husband in 1932. Simpson would gain a divorce from Lydia in April 1938, and marry Anne a month later (Laporte 2007b). In 1942, Simpson became the first elected President of Society of Vertebrate Paleontology. In 1942, after the Director of the American Museum of Natural History disbanded the department of vertebrate paleontology, to Simpson's dismay, he was promoted to curator of fossil mammals, but in December of that year he started duty with the U.S. Army as a captain in military intelligence—after completing a six-week course in one week (Laporte 2007c). In August 1944, slowly recovering from a hepatitis infection, Major Simpson was released from duty with two Bronze Stars. The same year, Simpson became the chairman of the newly created Department of Geology and Paleontology at the American Museum of Natural History, and in 1945, he also took a position as professor of vertebrate paleontology in the department of zoology at Columbia University. Simpson's classic work, Tempo and Mode in Evolution, was published in 1944. In this work, he integrated paleontology within the modern evolutionary synthesis (Hull 1988). In 1949, he published a popular account of modern evolutionary theory from the point of view of paleontology, The Meaning of Evolution, which was to become widely sold and translated into ten languages. Simpson was Professor of zoology at Columbia University and curator of the Department of Geology and Paleontology at the American Museum of Natural History from 1945 to 1959. In 1958, he gave up chairmanship of the Department and resigned shortly thereafter from the American Museum, taking an appointment as professor at the Museum of Comparative Zoology of Harvard University. He was curator of the Museum of Comparative Zoology at Harvard University from 1959 to 1970. In 1963, when Anne was made a professor at Harvard University, Simpson and his wife became the first husband-wife couple to be full professors at Harvard (Laporte 2007c). In 1968, Simpson was appointed professor of Geosciences at the University of Arizona, from which he retired in 1982, at the age of 80. He continued part-time with the Museum of Comparative Zoology at Harvard until 1970 as well. In 1984, Simpson's final book, Discoverers of the Lost World, was published, which, like his first, Attending Marvels, is about South America (Laporte 2007c). On Saturday, October 6, Simpson died of heart failure in a Tuscon hospital. A manuscript he was working on, dealing with extinction, was posthumously published the next year. He couldn't tolerate a toady, for his intellectual honesty was too great and his perceptions too acute to misidentify this genre. But neither could he bear disagreement, however gently expressed. He took offense easily, placing the worse possible interpretation on any event that displeased him. This bitterness seemed so inconsistent with the grandeur of his prose, the generosity of his vision, the warm and expansive humanism of his general writings. "Man is the result of a purposeless and natural process that did not have him in mind" (Simpson 1967, p. 345). "I don't think that evolution is supremely important because it is my specialty; it is my specialty because I think it is supremely important" (Larson 2004). "The regular absence of transitional forms is not confined to mammals, but is an almost universal phenomenon, as has long been noted by paleontologists." Gould, S. J. 2007. George Gaylord Simpson. The Stephen Jay Gould Archive. Retrieved December 22, 2007. Hull, D. L. 1988. Science as a Process: An Evolutionary Account of the Social and Conceptual Development of Science. Chicago: The University of Chicago Press. Laporte, L. F. 2007a. George Gaylord Simpson: Introduction. UC Santa Cruz: Information Technology Services. Retrieved December 22, 2007. Laporte, L. F. 2007b. George Gaylord Simpson: Biography. UC Santa Cruz: Information Technology Services. Retrieved December 22, 2007. Laporte, L. F. 2007c. George Gaylord Simpson: Chronology. UC Santa Cruz: Information Technology Services. Retrieved December 22, 2007. Public Broadcasting Service. 2007. George Gaylord Simpson]. PBS. Retrieved December 22, 2007. Simpson, G. G. 1967. The Meaning of Evolution. New Haven: Yale University Press. History of "George Gaylord Simpson"
This page was last modified on 25 July 2016, at 15:23.